The Stationsplein at Enschede-Drienerlo, i. e. the plaza in front of the railway station, is located in direct proximity to FC Twente Enschede’s football stadium and near the pioneering ‘Business & Science Park’ project. 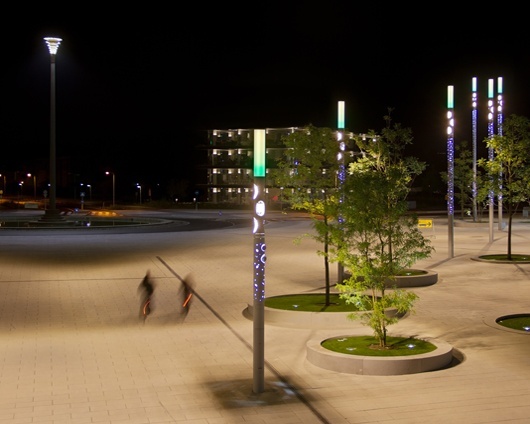 The concept for the lighting design was realised by ewo based on our competence in integrating numerous lighting systems – sometimes even within the same lighting fixture – and our experience in producing high-quality metal products. 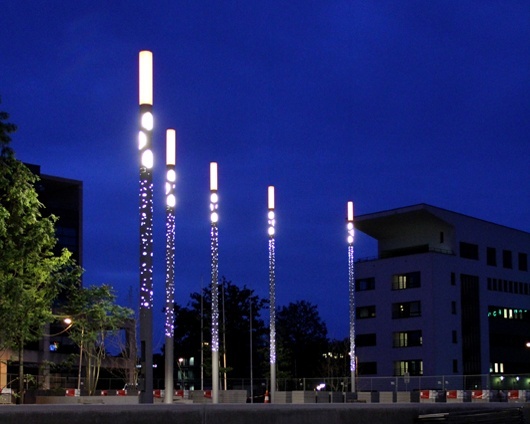 The railway station plaza is illuminated by a number of round posts. The individual height, ranging between 7.85 and 15.5 metres, is calculated according to the breadth of the segment that is to be illuminated. 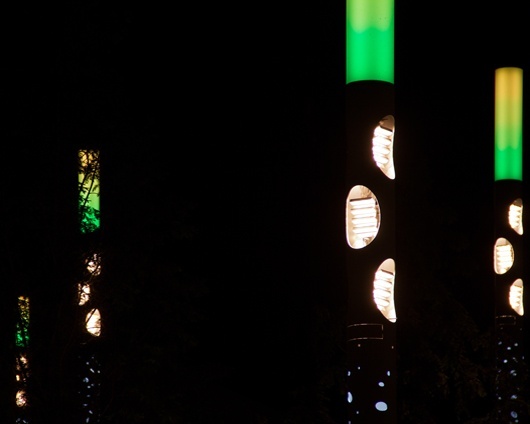 Lighting units installed below the top of the posts and arranged to shine on the area in question provide the basic level of illumination through their elliptical openings. In addition, light also shines through countless decorative perforations in the lower section of the post. The color of the light from the LEDs encased in the diffusely translucent plastic cylindersat the top can be adjusted to match those of the home team playing at the stadium. The entire system can be dimmed and additional control options make it possible to create a varietyof nocturnal impressions on the plaza. An individual high mast in the middle of a trafficisland in front of the stadium provides illumination for the traffic there. 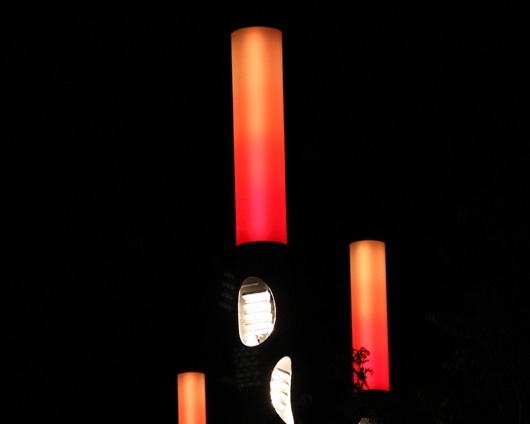 It is encased in a grid of conical units painted bronze, stacked one on top of the other, each are equipped with a different number of lighting units. The result is like a diamond seen from the back with light radiating from its facets, it serves as a landmark visible from afar.